Upon its creation in 1971, Amtrak inherited a motley collection of beat-up cars from the nation’s former passenger carriers. With a mission to attract passengers back to train travel, one of Amtrak’s first orders of business was to create a modern passenger fleet. The first of nearly 650 new Amfleet cars was delivered in 1975, with a sleek, rounded body that looked more like an aircraft fuselage than a traditional passenger car. Amfleet cars gave passengers the feel of traveling in a modern jetliner — but with more room and better views. At the same time, Amtrak introduced its F40PH passenger diesel, intended for commuter and medium-haul service as a complement to new long-haul locomotives. But when those larger engines proved trouble-prone, the 3000 hp F40PH stepped up as the little engine that could. It took over passenger runs from coast to coast and became the backbone of Amtrak’s locomotive fleet for decades. 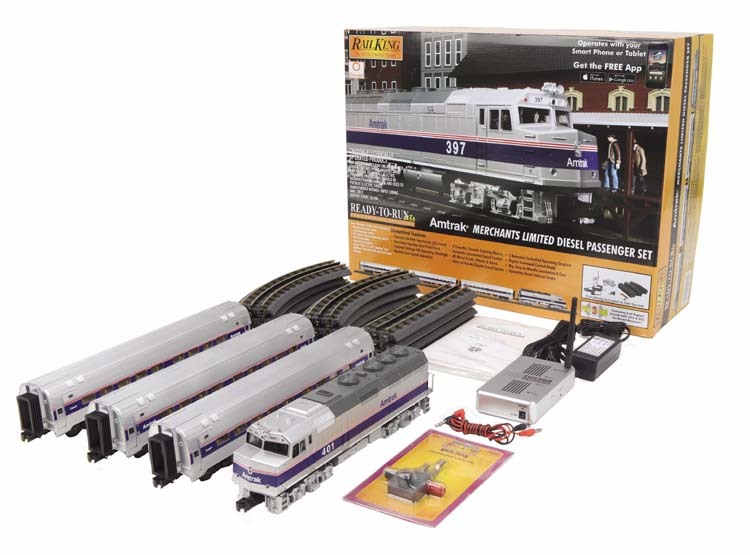 This set replicates the F40PH-powered Amfleet trains that were the first step in Amtrak’s revival of the U.S. passenger train. Its Proto-Sound 3.0-equipped diesel features Proto-Speed control for smooth, steady speeds from a crawl to full throttle; remote-controlled Proto-Couplers; and LED lighting. It also offers a full symphony of train sounds, from diesel motor to wailing horn, clanging bell, crew conversations and arrival and departure announcements for the Merchants Limited — which ran along the famous Shoreline route from Boston to New Haven, where the Limited switched to electric locomotives that would take it south to New York and Washington, DC.